For the longest time, metal-based manufacturing has been difficult and costly. High-strength aluminum alloys are difficult materials to work with for additive manufacturing, also known as 3D printing. Now, researchers from HRL Laboratorieshave developed a new method that allowed them to 3D print high-strength aluminum and weld previously unweldable material. “We’re using a 70-year-old nucleation theory to solve a 100-year-old problem with a 21st century machine,” Hunter Martin, a PhD student at the University of California, Santa Barbara and engineer at HRL’s Sensors and Materials Laboratory, said in a press release. The HRL researchers came up with a method they’ve called nanofunctionalization, where nano-functionalized powders are fed to a 3D printer. This is applied in thin layers which are heated by a laser to solidify into a three-dimensional object. During melting and solidification, the structures produced using this method don’t crack and are able to maintain their full alloy strength, thanks to the nanoparticles acting as nucleation sites for the intended alloy microstructure. “Our first goal was figuring out how to eliminate the hot cracking altogether. 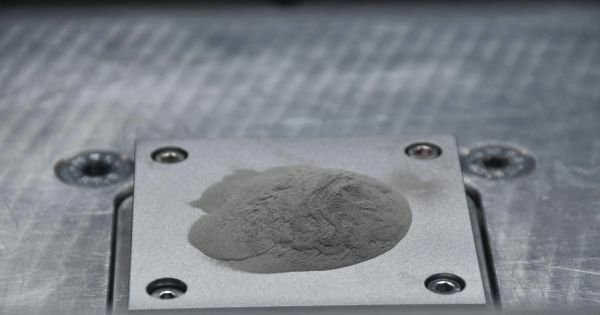 We sought to control microstructure and the solution should be something that naturally happens with the way this material solidifies,” Martin said. High-strength alloys like aluminum — including types like Al7075 and Al6061 — are currently used in engineering aircraft and automobile parts, like in airplane fuselages. However, current methods are largely expensive and are unable to allow finer manipulation of these materials. This entry was posted in Technology & Science and tagged 3D, a, Aluminum, Found, Print, strong, Super, to, Way. Bookmark the permalink.